OTTAWA—Although the topic at a House of Commons foreign affairs committee hearing on April 24 was “Canada’s Engagement in Asia,” most of the witnesses focused their testimony on China. Pitman Potter, a professor at the University of British Columbia’s A. Allard School of Law, said it’s important for Canada to understand that the rule of law in China—or the absence thereof—means something very different from that in this country. 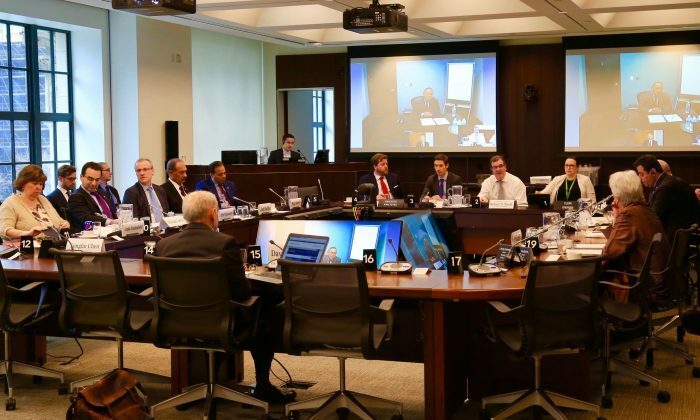 Testifying via video conference, Potter said that for Canadians, the rule of law means things like the protection of citizens’ rights and limitations on government action, but the rule of law in China is a “Socialist rule of law” established by the Chinese Communist Party (CCP). “Law in China—despite the term ‘rule of law’ and the deliberate attraction of expectations about what the rule of law means—is something quite different altogether, and it really is submission to Party rule,” he said. This, in effect, is an absence of the rule of law. “So when I think about what the implications of this are for Canada, it’s important to note that this is not simply a domestic matter. This affects China’s treaty compliance, China’s respect for its own laws, its respect for international treaties, and things like human rights, ethnic minorities, and trade,” he said. Matas went on to explain his work with former MP David Kilgour to expose the crime of forced organ extraction from Falun Gong prisoners of conscience in China. He noted that since he and Kilgour released their first report 12 years ago, evidence has accumulated and other researchers have engaged the issue, including U.S. investigative journalist and China expert Ethan Gutmann. “A joint report with Gutmann released in June 2016 found that the volume of transplants in China was up to 100,000 a year, and that the bulk of the sources were prisoners of conscience—Tibetans, Uighurs, house Christians, and primarily practitioners of Falun Gong,” Matas said. He made several suggestions on what Ottawa can do to help curb forced organ harvesting, including acting on statements endorsed by the Subcommittee on International Human Rights in 2013 and 2015. “Both statements called on medical and scientific professional and regulatory bodies to name, shame, and ostracize individuals, institutions, and their affiliates involved in the forced harvesting and trafficking of human organs,” Matas said. “Right now there is an active debate within the international transplant profession about whether to engage or ostracize the Chinese transplant profession in light of the Chinese official opacity about transplantation and the overwhelming evidence of continuing transplant abuse” Matas noted. Matas also said Canada should call on Beijing to cooperate with an independent international investigation into organ transplant abuse in China. The others who testified were Charles Burton, an associate professor of Political Science at Brock University; Paul Evans, interim research director of the Institute of Asian Research and a professor at the Liu Institute for Global Issues at UBC; Ngodup Tsering with the Office of Tibet in Washington, D.C.; and Chen Yonglin, a former Chinese diplomat who defected to Australia in 2005. Beijing has become “more aggressive” in working to achieve that, he said. Chen referred to the book “Silent Invasion: China’s Influence in Australia,” an exposé of the CCP’s extensive infiltration of Australia written by Clive Hamilton. “It is almost too late for Australia to defend itself against China’s interference,” Chen said. He also noted that “the appeasement of Western countries helped China join the WTO without completely fulfilling its obligations. That enabled China’s economy to benefit from free trade without making the slightest move towards democracy,” he said.